I pretty much bring up chips in conversation about once a week around here. If you haven’t noticed by now, I definitely have a problem. So when I sat down to think about what I should share in celebration of Mother’s Day, I thought about what I love to eat the most. CHIPS. What mom wouldn’t love a homemade version of her favorite snack? If my family made me these BBQ Sweet Potato Chips I would love them forever. Well, I guess I will no matter what but I would try not to be so grumpy when they woke up way too early the next day. Because we know that will happen as my kids are extreme morning people that wake up loud and energized with about 50 stories to tell. Lord help me. Another benefit of homemade chips is the recipe makes a smaller amount and they get eaten right away since they are best fresh so that means there isn’t a giant bag lying around calling my name. Potato chips have been know to do that in my house you know. 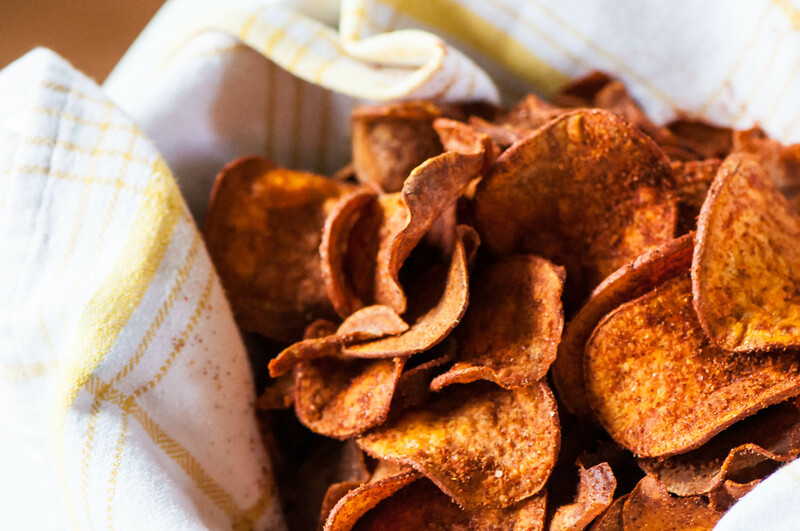 My favorite kind of chip is a salty, crunchy kettle chip but you have to go big for Mother’s Day so I added a sweet and spicy BBQ spice blend and used sweet potatoes to add another slight layer of sweetness. The spice rub is a blend of onion powder, garlic powder, paprika, chili powder, cayenne and brown sugar. Once the chips are fried, toss them in a brown paper bag to soak up the excess oil and sprinkle on the BBQ spice blend and shake shake shake to coat. You want your sweet potatoes to be sliced as thinly as possible to yield a perfectly crispy chip. I recommend using a mandolin for slicing potatoes for chips (and lots of other things) as it will result in beautifully thin and uniform slices. If you don’t have one, just carefully cut the sweet potatoes as thinly as possible. Heat the oil while you are slicing the potatoes then it will be ready to go and only take a few minutes to fry them up. It’s kind of bad to know how simply and quickly you can make homemade chips. But at the end of the day, it always is better to make something homemade so you know exactly what you are consuming. So, homemade chips it is!! Pour oil into a heavy pot or countertop fryer and heat to 350 degrees F. Meanwhile, slice sweet potatoes as thinly as possible. In a small bowl, combine chili powder, paprika, garlic powder, onion powder, cayenne, salt and brown sugar. Once oil is heated, add sweet potato slices in batches making sure not to overcrowd. Fry for 4 to 8 minutes, stirring frequently and watching carefully as they can burn quickly. Remove from the oil with a slotted spoon and place in a brown paper bag. Sprinkle with the BBQ spice blend, close the bag and shake until the chips are completely coated. Yum! I think this will be a fun one to try with the kids this summer. They will love the shaking part!